Looking for a inside grill. 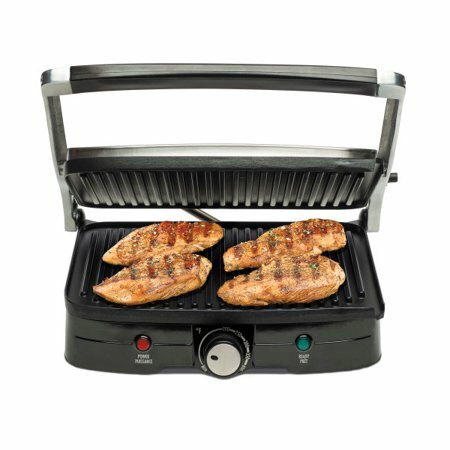 Purchase the Hamilton Beach Indoor Grill with Panini Press on Walmart.com. Only $24.47, regularly priced $39.99 + Free Store Pickup. Get restaurant results at home for a fraction of the cost with the Hamilton Beach Panini Press & Indoor Grill. Using your own fresh ingredients, you can make everything from a basic grilled cheese to a mouth-watering Reuben sandwich. Thanks to a café-style floating lid that evenly presses sandwiches of all sizes, how thick or thin you’d like your sandwich is up to you. The grill is easy to use, since power and preheat lights let you know when it is ready. The 99 square inch cooking surface gives you plenty of space to make more than one sandwich at the same time. When finished, the nonstick grid cleans up easily.